Blind Willow, Sleeping Woman. Haruki Murakami, (translated by Philip Gabriel and Jay Rubin). Published by Harvill Secker, 2006, ISBN 1400044618, RRP $32.95. 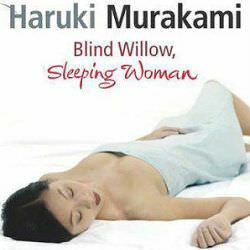 Blind Willow, Sleeping Woman is the 12th book by Haruki Murakami in English translation, and his second collection of short fiction. The release follows the excellent Kafka on the Shore (2005), for which avid Murakami fans had to wait three years before it was translated into English. Blind Willow has not taken quite so long to appear in English, though some of the stories have only been available in other, Japanese-only collections for up to two decades. In the introductory notes to this English language edition of his latest work, Murakami himself declares, ‘I find writing novels a challenge, writing stories a joy. If writing novels is like planting a forest, then writing short stories is more like planting a garden.’ This elegant analogy serves to give the reader some idea of what awaits. This collection of short stories spans Murakami’s career, from 1978 when he sold the jazz club he ran with his wife, through to 2005, when he was compelled by an inner demon (or angel) to write his first collection of (fiction) stories in years. The stories in the collection are replete with the sort of epiphanies and moments of clarity that Murakami thrives on – if there is a ‘theme’ or unifying thread it is one of momentary revelation. As anyone familiar with the works of Murakami would know, this seems to be something of a break from form. Murakami, while not ‘literary’ in the same way that Ishiguro or Oe are, is a master of the obscure, the oblique, and the sometimes maddening. The contradiction, with some decrying him as a ‘pop’ novelist, and others according him the ever-trite ‘spokesman for his generation’ tag, is alive and well in this collection. These are stories that will delight and intrigue the reader. From A Perfect Day for Kangaroos, an inconsequential nothing about a boy and a girl, to ‘A “Poor Aunt” Story’, a story about a man who has, literally, a ‘Poor Aunt’ appear on his shoulders one day, Murakami’s stories are full of whimsy and intrigue. Given the amount of time these stories span, one might wonder about how the tone and timbre of Murakami’s voice changes over time. The truth is, simply, they don’t change much. Murakami is possessed of a unique literary voice among his contemporaries, and there is something unique to this voice which makes the stories identifiably his own. On the other hand, his style of story-telling does change. He seems to flit between two distinct styles, both in this collection, and more broadly through his career. 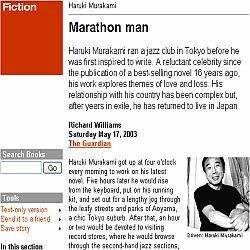 There is the engaging, narrative driven Murakami, in which tight plotting and likeable, often sad, disconnected characters play out their roles – the ‘pop’ Murakami. Then there is the ‘literary’ Murakami – heavy with allusion and inference, dense, at times difficult to persevere with and decipher. Of his novels, Norwegian Wood and South of the Border, West of the Sun fit firmly into the former category, and Hard Boiled Wonderland and the End of the World, and Kafka on the Shore clearly into the latter (his masterwork, The Wind-Up Bird Chronicles, manages both). Within this collection, there is an eclectic mix of the accessible and the illusory. Tony Takitani, for example, is a beautiful vignette, which has been made into a short film. It traces the sad life of a solitary man, an illustrator, who one day wakes from his slumber of loneliness. New York Mining Disaster, on the other hand, is a curious piece which seems to be misnamed until the last moment, when an eerily confusing, near throw-away paragraph shows, but does not explain, where the title comes from. Some have criticised Murakami for his aloofness, and his disconnected characters, for a lack of human-ness in some of his characters. Others, as mentioned, feel he could never belong to the pantheon of ‘literary’ greats, as he is far too plugged into contemporary culture. Surely though, the mark of a great writer is the ability to precipitate strong opinions, and further, to be seen as both accessible, and complex. Murakami, in my opinion, is simply a master of his craft. His attention to detail is always a delight. What is particularly pleasing about this collection is some of the small things that come out of the reading of these stories. For example, I now know why, in so many of his novels, characters are described cooking pasta. The undoubtedly autobiographical The Year of Spaghetti leaves one with little doubt about the origin of so many spaghetti-eating characters down the years. Much like F. Scott Fitzgerald, Murakami mines his story ideas again and again. Threads, ideas, and fragments of novels appear in these short stories, in a pared back form. Fitzgerald, along with Raymond Carver, is one of Murakami’s literary idols. Both of them are also now available in Japanese, due to Murakami’s hobby of translation work. This is a collection of fiction that I could not recommend highly enough to both the initiated and the un-initiated – though I am hardly an unbiased reviewer. For people really wanting a sense of why this man is such a great writer, I would recommend Norwegian Wood as a starting point – it is more of a human story – and for people who want something to really sink their teeth into, start with The Wind-Up Bird Chronicles. Otherwise, go out and buy Blind Willow, Sleeping Woman. Thank James for your literary reviews. I suppose Globalisation is making literature from all cultures converge into some universal stream about our contemporary world, like the different viewpoints of the same truth. Interesting review, but i'm sure you can do better!